We headed north to Toronto this afternoon to spend the day downtown. Not only is Toronto the capital of Ontario, but its also the most populous city in Canada and the fourth most populous city in North America. There are so many things to do in Toronto, but we only had one afternoon to spend there, so we had to choose wisely. We started with the Royal Ontario Museum (aka the ROM). They've got a fairly impressive dinosaur exhibit along with an endangered species exhibit that includes specimens of a polar bear, a giant panda, a white rhinoceros, a Burmese python, Canadian coral, a leatherback sea turtle, a coelacanth, a Rafflesia flower, and many other rare species. There are also recently extinct species displayed, including specimens of a passenger pigeon and a great auk, as well as skeletons of a dodo bird and a moa with a specimen of a moa egg, and many other recently extinct species. 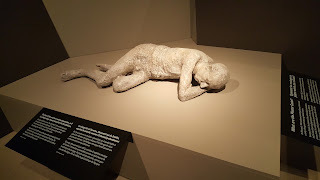 The best part of the museum, though, was the Pompeii exhibit. The city of Pompeii was an ancient Roman town that was destroyed and buried under 20 ft of ash and pumice in the eruption of Mount Vesuvius in 79 AD. People who were buried beneath the ruins left voids in the ash which were filled with plaster, thus preserving the positions in which they died. There are a number of Pompeii casts on display at the Royal Ontario Museum along with other Pompeii artifacts like statues and mosaic tiles. We moved on to the Ripley's Aquarium. It's located right next to CN Tower, so just look up and head in that direction. 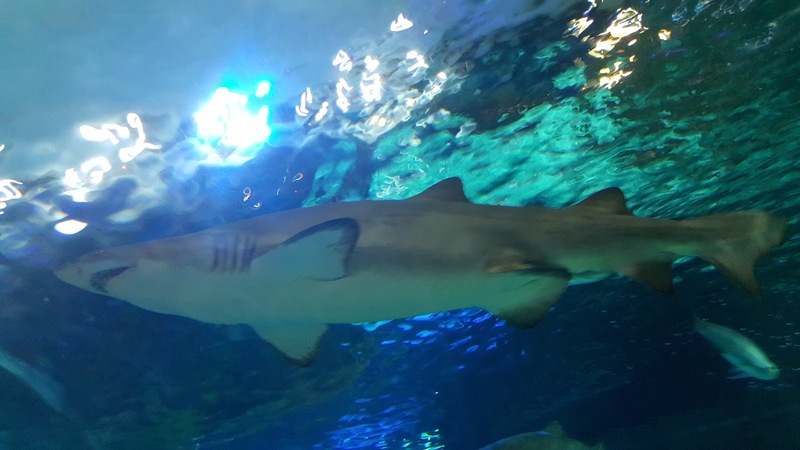 The aquarium features several aquatic exhibits including a walk-through tank. The aquarium has 1.5 million gallons of marine and freshwater habitats from across the world. The exhibits hold 13,500 exotic sea and freshwater specimens from more than 450 species. The best part of the aquarium is the The Dangerous Lagoon exhibit which is an underwater tunnel with a moving side walk. It's the aquarium's largest tank and it was thrilling to walk underneath the sea creatures as they swam by. I will say that I was getting a little ticked off at the folks who kept blatantly ignoring the "No Flash Photography" signs. And I was especially ticked at the people whom I saw teasing the octopus. We headed over to the CN tower for dinner. The CN Tower (aka "La Tour CN" for the French speakers) is a 1,815 ft high concrete communications and observation tower in downtown Toronto. It is the 3rd tallest tower in the world and is the tallest free-standing structure in the Western Hemisphere. Its name "CN" originally referred to Canadian National, the railway company that built the tower. Following the railway's decision to divest itself from the structure, it transferred the tower to the Canada Lands Company, a federal Crown corporation responsible for real estate development. Since the name CN Tower became common in daily usage, the abbreviation was eventually expanded to Canadian National Tower or Canada's National Tower. If you want to go up in the tower, you've got a few options. You can directly pay for a ticket to the observation tower. Reserve a table at the 360 Restaurant which offers a rotating view of the city. Your ticket to the observation will be comped. Try to go up there just before sunset so you can see both the daylight view and then the night time view from the tower. 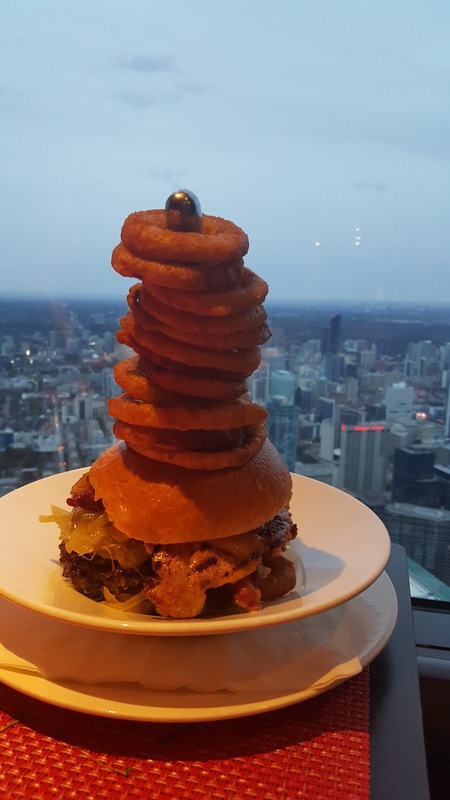 If you can't get a reservation at the 360 restaurant, but you still want to get something to eat you can always pay for a ticket to the observation deck and then visit the Horizon's restaurant up there. It doesn't revolve, but the food is good and is somewhat reasonably priced. 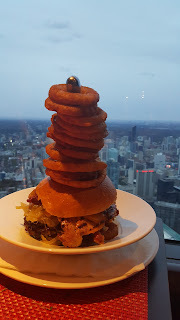 I had their signature 360 burger which is a burger topped with ham, bacon, cheese and 7 onion rings. While at the Ripley's Aquarium and the CN Tower, we ran afoul of a number of Taylor Swift fans who were lining up early at Rogers Centre to catch her show tonight. I'm glad we got out of there when we did because it was starting to get pretty crazy down there.